Small carrot cake with caramel cream cheese frosting is a one-layer cake for Spring and Easter! My poor, poor husband. He’s thousands of miles away from this luscious carrot cake with caramel cream cheese frosting while I’m over here with my feet up eating it happily. Carrot cake is totally his jam, and I make a lot of it this time of year. While we love warm mini carrot cakes with melted cream cheese frosting, we also love cold carrot cake right out of the fridge. 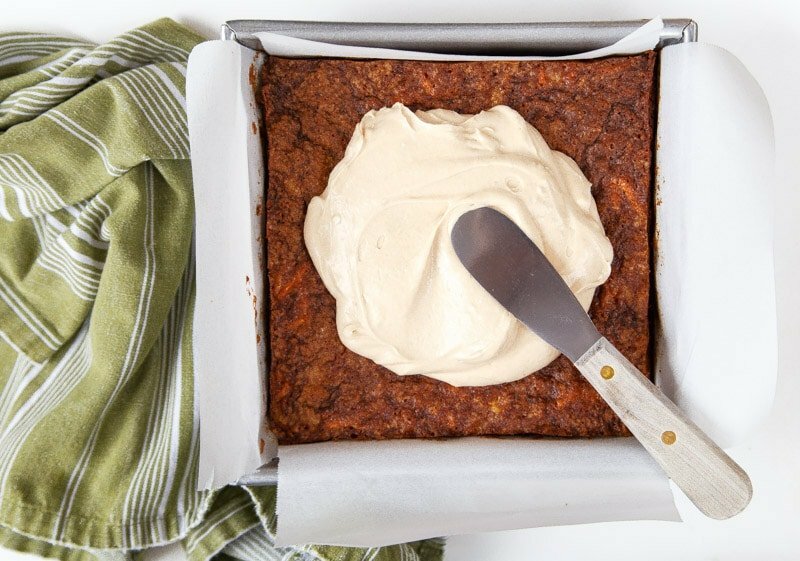 This is one of those cold carrot cakes you sneak for breakfast with coffee. I’m not sure how big your Easter celebration is going to be, but I’m guessing carrot cake is on the menu. While I already have a mini carrot cake for two on this site, I thought I would make you a slightly bigger one. I’m not skimping on the frosting here. Just because it’s a single layer carrot cake doesn’t mean we can’t have mounds of frosting. And instead of cups and cups of powdered sugar in a standard cream cheese frosting recipe, we’re going to stir in melted caramel sauce. Oh yeah, baby. This will be your new go-to cream cheese frosting recipe. My version of carrot cake has pineapple in it. I hope that’s okay with you! My family can be purists about carrot cake and insist that it should not have walnuts, raisins, or pineapple. They love this version! I should warn you that the cake is going to sink ever-so-slightly in the center as it cools. I’ve never met a carrot cake that doesn’t sink a tiny bit. 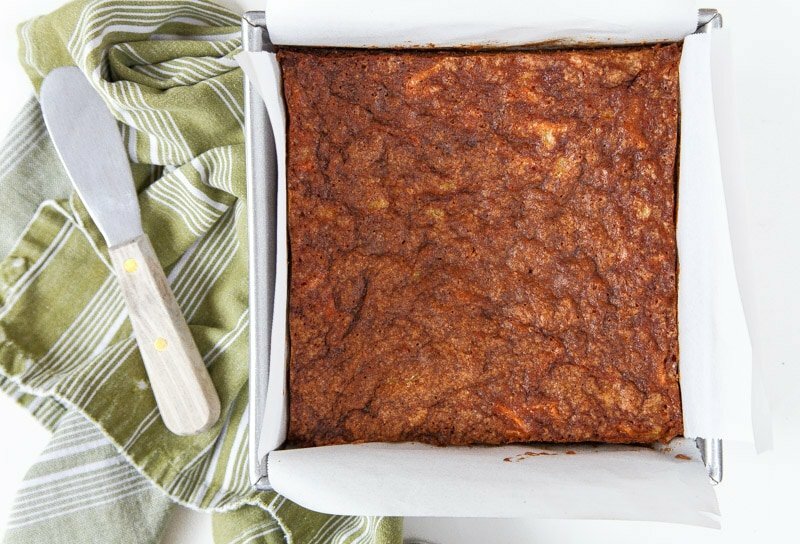 Carrot cake is warm, spicy, and so very moist. In order to make a non-sinking flat or domed carrot cake, the texture of the cake would have to be altered to be too light and fluffy. That is just not carrot cake, my friends. Carrot cake is dense and moist, and that’s exactly the way it should be. My grandma’s carrot cake sank, and my grandkids’ carrot cakes will sink, too. It’s just the only way to do it. So, grab your brownie pan, a handful of carrots and caramels, and make this small carrot cake. Tell me it isn’t the most delicious carrot cake you’ve ever had! Small carrot cake (single layer) with caramel cream cheese frosting. Preheat the oven to 350, and line a 8x8-inch square pan with parchment paper on all sides (see photo for reference). In a large bowl, stir together with a wooden spoon (do not use a mixer) the oil and sugar. Add the eggs, vanilla, pineapple and carrots. In a separate bowl, stir together the flour, baking powder, baking soda, and cinnamon. Sprinkle the dry ingredients over the wet, and stir until combined. Pour the batter into the prepared pan, and bake for 33-36 minutes, until nicely golden brown and starting to pull away from the edges. Let the cake cool--it will slightly sink in the middle, but it's fine. As the cake cools, whip together the frosting: melt the caramel bits in the microwave with a splash of water. Set aside. With an electric mixer, beat the cream cheese and powdered sugar until light and fluffy. Stir in the caramel and vanilla. 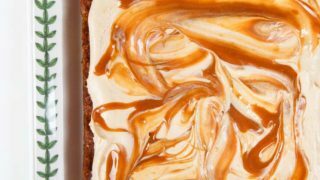 Frost the cake with the caramel cream cheese frosting, and serve. The caramel in this frosting is dang near perfect!! Love this! I have to have pineapple in my carrot cake—so scrumptious! And this is the perfect size for me!!! This looks amazing! That caramel icing = yum! I’ll be making this for sure, but first I am embarrassed to ask: what are caramel bits? YAS! This gets all the yases in the world right now. Delish! I seriously cannot wait to try this caramel cream cheese frosting!! I have asked twice what are caramel bits and my comments appear and disappear before an answer can be obtained. I would like to make this cake, but I will ask only one more time: what are caramel bits? Hi Nancy! I’m sorry for the confusion! I haven’t deleted any comments, so I’m not sure what’s going on. I thought I answered this question earlier, but it was on the Caramel Nut Brownie Sundae recipe, so I thought it was on this recipe! So sorry! Regular caramels chopped do not work in this frosting. Found out the hard way. That caramel cream cheese frosting tho…!!! Need. I just can’t get over that frosting – nom nom!! 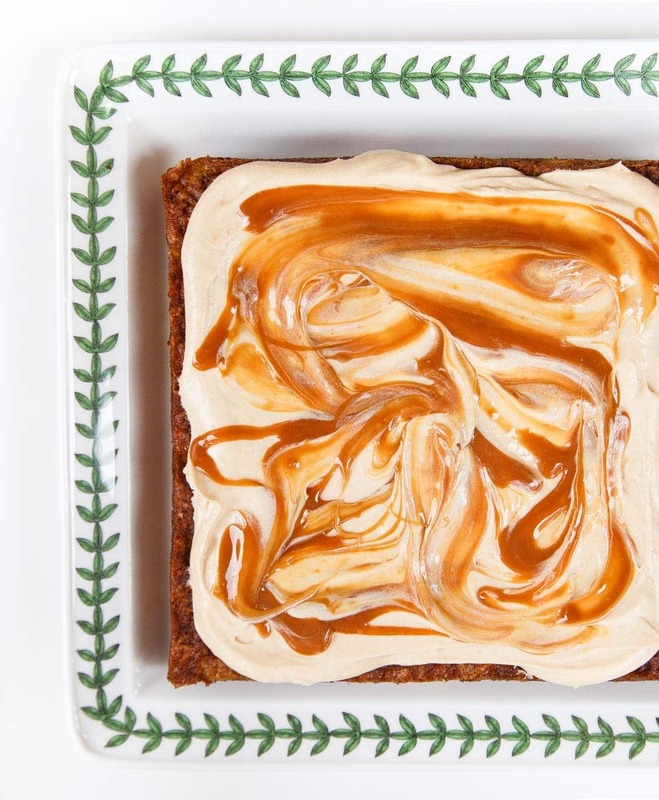 You had me at carrot cake and sent me to my VERY HAPPY PLACE with the caramel frosting! Yum! Pinned! Hi – and thanks for this amazing sounding and looking recipe! I wonder if it would be possible to use the recipe to make cupcakes instead of in an 8×8 pan… I’m thinking it might make 6 cupcakes? No matter what, I’ll keep that frosting recipe – yum!!! Thanks! I’m confused about parchment paper. Do you remove cake off of parchment paper , carefully placing it into a different square pan before frosting? It sounds amazing. I’m thinking of toasting pecans and adding on top of frosting. Thanx so much! Hey! I’m not a big fan of pineapple (or raisins but that’s not listed here) in carrot cake. Do you think I could try replacing with a different liquid? This cake and the FROSTING are making my stomach grumble. Hi Sara! I haven’t tried the recipe any other way than the way its written, but what about just adding more carrots? The directions indicate to add sugar (granulated) in both steps 2 and 3. Which should it be? I added it with the wet ingredients (and it smells delicious cooking) so hopefully that works. Sorry! Fixed it! I wrote the recipe when I had a sick kid in my lap-hah! The recipe still shows sugar in both steps 2 and 3. Which one is correct? Thanks! Making this recipe for my boyfriend’s birthday, but he’s a bigger apple than pineapple fan—would substituting apple sauce require any other changes? Hi Ethan! I haven’t even thought about it, but you know, I do think apples would be just fine here. Grated apples and grated carrots have similar moisture levels. Plus, I love the caramel + apple combo. I think you just dreamed up a whole new cake recipe for me ;) Let me know how it goes! Tell your bf Happy Birthday! So was the melted carmel to be mixed into the cream cheese and powdered mixture? That’s what the directions said, but the picture shows it swirled ontop. I did add it to 5he cream cheese mixture and it seems running and lumpy. Follow the directions as written. Then, if you like, swirl extra caramel on top. If your cream cheese is lumpy, that means it’s not at room temperature before you mixed it. If it’s not soft, the liquid can’t mix into it. Let it rest on the counter for a bit and then re-mix. I made this from your new cookbook (LOVE!) and my family loved it so much they’re demanding it for Easter this weekend so I’ll be attempting to triple the recipe for a layer cake. The recipe as is was perfect for 5 mini-6 inch layers, where I added some of the caramel between the layers, it was so delicious! Made this today, the best carrot cake recipe I have ever made, so moist, and delicious. I did not even frost as we are not really frosting people, sprinkled the top with shredded coconut instead. Love the smaller size, as there are just the two of us, thanks for sharing! Hi! Thank you for the recipe, i just made it and so delicious my husband and my 2 years old daughter loved it too. I’m thinking to make it on my daughter’s birthday but i need a big size of cake, do you have the recipe for that? thank you. I don’t, sorry! You might be able to double this and bake it in a 9×13 pan? made this today and i doubled the recipe, used 9×13 pan as you said, it turned out almost perfect except one thing, it’s a bit of oily, when i removed the cake from the pan, more oil is in the pan, is there any way i could use less oil, what can i substitute with oil? Thank you for the recipe. God bless. Oh, man. I made this recipe as 6 jumbo cupcakes and it turned out amazingggg. Ah. Maz. Ing. I couldn’t find caramel bits or melts, so I made a bourbon caramel sauce and added some lightly toasted walnuts with sea salt for a bit of crunch and a salty note atop the frosting. This is now my go-to carrot cake recipe. So fantastic. Also, caramel deepens the flavor of the cream cheese icing brilliantly – it’s subtle, but awesome. By any chance do you have this same recipe for cupcakes? I made this one and everyone loved it. It’s perfect! Thanks! curious — what if I wanted to add golden raisins and pecans. Would I have to make an adjustment to the other ingredients? Hello again & thank you for yet another perfect 10 recipe! As always, I made some changes that may help other who like to make things their own: I swapped carrot for zucchini. I grate it over paper towels & squeeze out the excess moisture because moisture is what causes this cake to fall. I didn’t have crushed pineapple on hand but I had canned pineapple chunks so I zipped it in my Vitamix for literally 2 seconds. Perfect! If someone had a blender vs a Vitamix or even a food processor, that would also work. I strained the liquid in my pineapple by spooning into a fine mesh (metal) strainer placed over a bowl. I reserved the liquid for future use. I used 1/2 dark brown sugar, 1/2 white sugar. I like the rich depth brown sugar brings. As mentioned in the recipe above, any neutral oil will work. I used canola. I used a full tsp of vanilla & a tablespoon cinnamon. I did not add the cream cheese frosting because 1) dairy doesn’t like me & 2) powdered sugar hurts my teeth. I topped my (first) piece of cake with a couple spoonfuls of pineapple juice mixed with applesauce. SO DARN GOOD! Though upon consumption (for science purposes, of course) of a second piece, I found the cake was perfect on it’s own & didn’t need frosting or applesauce. This was very easy to make & the cake came out very moist like carrot cake should. My cake is perfect & only a trained eye looking at the cake from the side can see the tiniest (shot glass circumference size) spot where the cake “fell”. The top is nearly straight across, so no big center pit! Perfect for frosting should you chose to go that route. Thanks again Christina for another delicious kitchen delight. Happy Easter! This Carrot cake is absolutely DELICIOUS. It’s so light. Making it without a mixer, I feel, contributed to it. I made an Orange Cream Cheese Frosting – I added vanilla, orange extract, and orange zest. I also used powdered orange food coloring till it was a light orange. Simply Heavenly. Perfect for Easter. Hi is it possible to put the batter in a round pan instead of a rectangular one? If yes, wht shld be the size of the pan? Thanks. Made this tonight and hubby LOVED IT! I’m not a fan of carrot cake, but I liked this, probably because of the addition of pineapple. The caramel cream cheese frosting is AMAZING!